Calling yourself an active Internet user? you might not be one if you haven’t heard about the latest bug in the Internet security, called Heartbleed. We talked a lot about Heartbleed here, but if you aren’t sure what this is all about, do check that article to understand it better, and keep yourself safe from compromising your account data. In short, Heartbleed is a bug in the OpenSSL security which was giving access to the hackers because there was an issue with the secret keys which get compromised and available to the hackers, and these secret keys are what would encrypt the traffic, including the names and passwords and all the personal content of the users. The research team which found this major bug, did make a tool available for the users to check and understand whether a particular website is affected by the bug or not. But this issue isn’t limited to just the Internet, but is also seen on the devices which are using particular versions of the OpenSSL security for the authentication and security of the devices. There were some suggestions from the security firms that staying offline and not playing around with your online accounts would be a safe option for now, but you can’t stay away from your Android device for long, right? Here’s an app which would at least tell you if your phone has the security version which is affected by the Heartbleed bug. 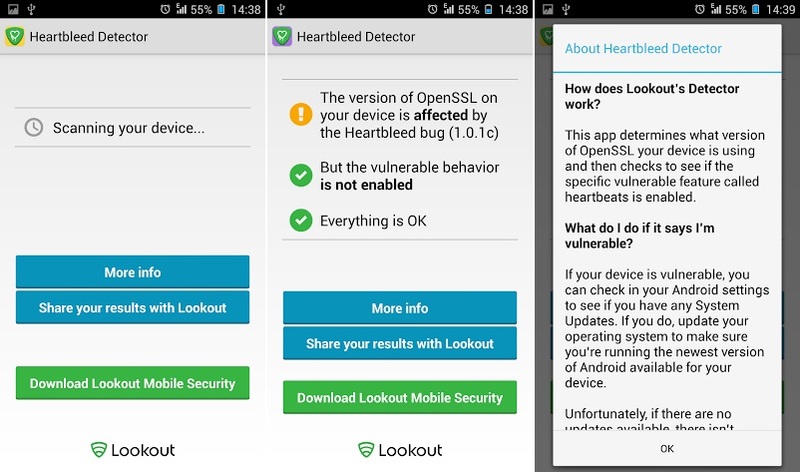 Heartbleed Detector is an app available for the Android devices, to check if the version of OpenSSL in your device is affected by the Heartbleed bug. There is a certain behavior which if enabled, could lead to a problem to the security of the device and that too is checked by the app. The app doesn’t do anything else than that, and it doesn’t check the individual apps for finding about the vulnerability, but you at least would get an idea whether the phone has a security version running which is at risk. And for now, there is no fix to this and if your device is running that version of OpenSSL, you need to ensure that the risky function is not turned on. Download Heartbleed Detector for Android from Google Play Store – Link. How to receive WhatsApp Notification on Lock Screen in Android Phone?